“Move your hips as if you’re with your lover,” our nine months pregnant yoga teacher tells us, speaking loudly but soothingly over the sound of the breeze coming off the ocean. We’re only a few minutes into the class, but already I can tell this will be different from any other I’ve taken before. The palm trees provide little shade and by 9:15 the sun is in its full intensity, reminding us that this is the sun of the southern Baja peninsula—stronger and brighter than one we had prepared for. Invigorated by this unexpected, if not slightly uncomfortable change to my routine, I ask myself why I don’t always start my Saturdays with fresh juice, coffee, and a vinyasa. Then I remember I’m from New York where winter lasts for six months and weekends are spent catching up on the sleep I didn’t manage to get during the week, and running through a list of errands. This feels easier, and I ignore the fact that it’s because I’m on a vacation, and chalk it up to settling into the easy leisure of Cabo San Lucas, and a new found sensuality in my yoga routine. Off the beaten path from this magnetic destination’s numerous big hotels and resorts, I’ve come to Cabo’s cove of La Playita where El Ganzo, a creative, sustainable, boutique hotel sits handsomely at the marina, a stone’s throw from the surfing beach of Costa Azul, and, most importantly, far away from anything else. “Civilization hasn’t caught up to us yet,” Ella Messerli, El Ganzo’s general manager tells me. The 70 room property, which was rebuilt after devastating Hurricane Odile swept through four years ago, was conceived to be a sort of “pirate ship for creatives.” Hosting guests is only part of the equation for El Ganzo which is a vibrant center of cultural and experiential exchanges, curating residencies for visual artists, musicians, and inventive chefs from Mexico and beyond. 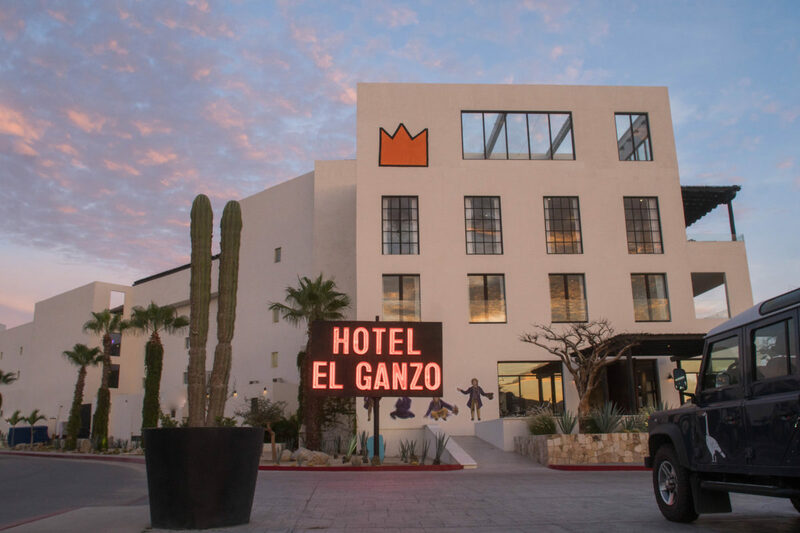 Artists, musicians, and chefs are hand-selected and invited to live for a short while at the hotel leaving their mark on the canvas that is El Ganzo. 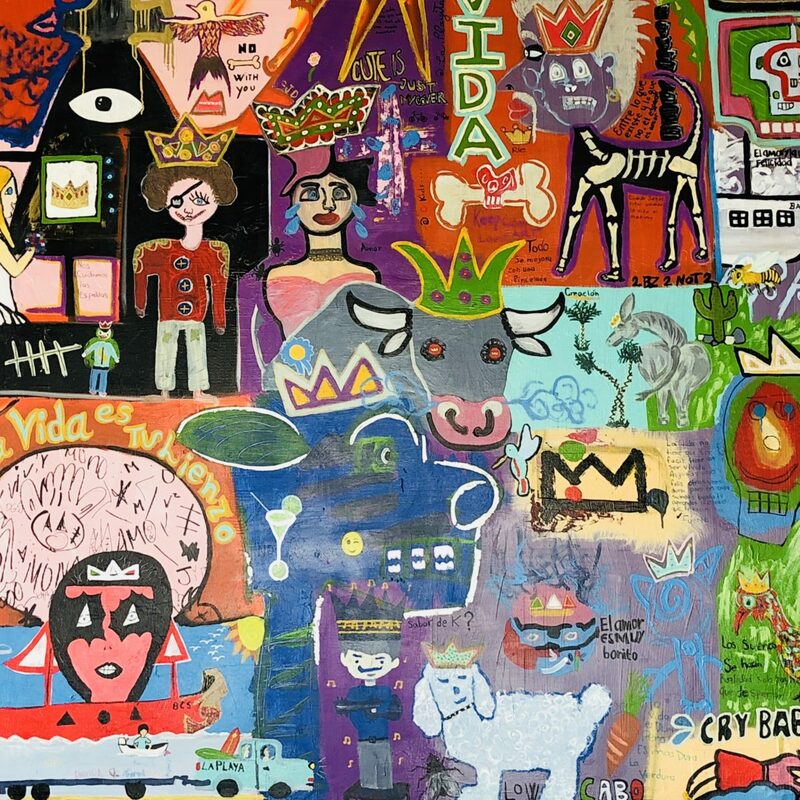 Visual artists are given space in the hotel’s public areas as well a guest room to cover with their creations. Musicians are offered round the clock access to the on-site state of the art recording studio, and chefs are allowed free range over the kitchen—the staff, the menu, the whole thing. The end result: (or I should say it’s more of a work in progress, as El Gnazo is forever evolving) almost half of El Ganzo’s 70 rooms have now been adorned with unique works by some of Mexico’s most innovative contemporary artists; musicians have recorded both for themselves and the hotel, and given a live concert for the guests and community at large; and chefs cook a gala meal of their creation and leave one signature dish on the menu. 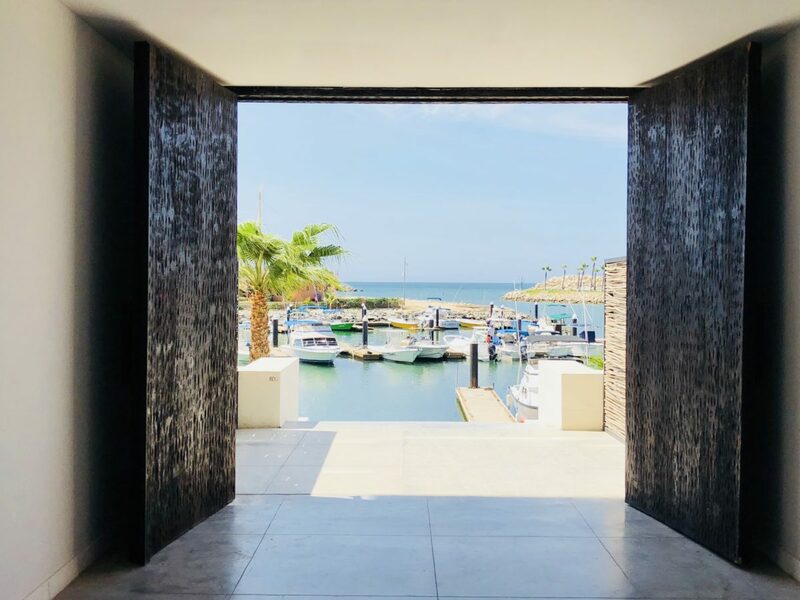 It’s a coveted residency, not only for the opportunity to work and create in one of the Baja California peninsula’s most innovative hotels, but because of the opportunity to stay, be moved and inspired by the landscape. 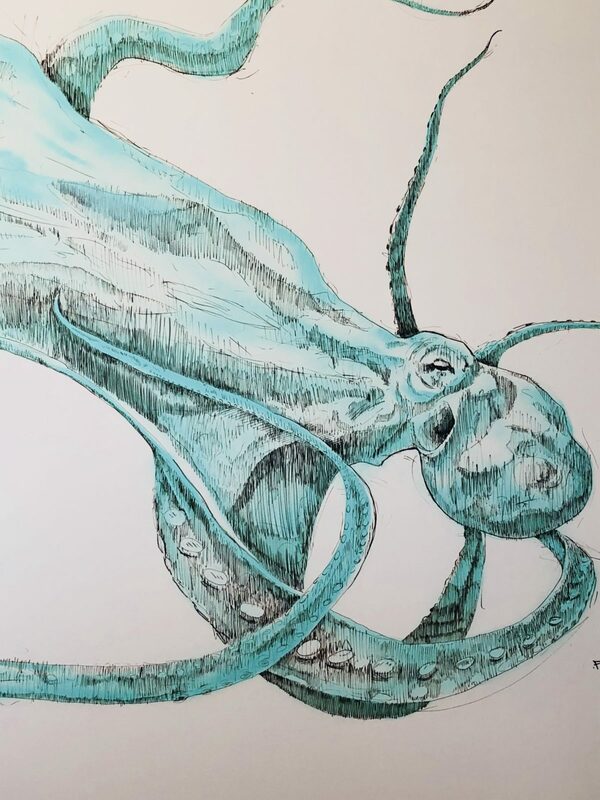 Drawing inspiration from the landscape—which means primarily the sea—is a natural for husband and wife culinary team David Castro Hussong and Maribel Aldaco Silva who are in residence at El Ganzo while I’m there. Even floating below their 30th birthdays, David and Maribel count time at New York’s Eleven Madison Park, Stone Barns (both at Blue Hill and in the city), and San Francisco’s Cala as a few stops in their culinary journey before opening up their own restaurant, Fauna, located at the winery-hotel Bruma in upper Baja’s Guadalupe Valley, ten months ago. Their celebrity status is tempered by their modesty, which for Maribel means she explains her pastry perfections in a tone merely above a whisper. It’s David’s 28th birthday the night of his El Ganzo gala dinner, and he’s arranged the outside tables into two communal banquets to reflect the unstuffy family feeling that comes through in his creations. He’s managed to turn the most basic vegetables into perfection—charred cabbage atop of cabbage puree and fennel floating on a rich chile chilhuacle. When I ask him if he and Maribel eat like this at home, he laughs. Along with plenty on mezcal, “I make scrambled eggs” he tells me. 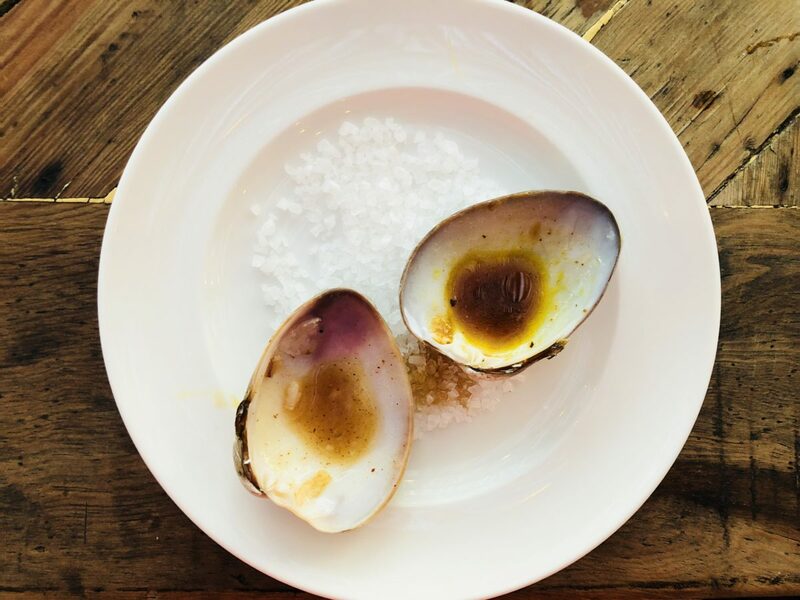 It’s the chocolate clam with green mango and chile chilhuacle that David hopes will stay on the menu at El Ganzo. 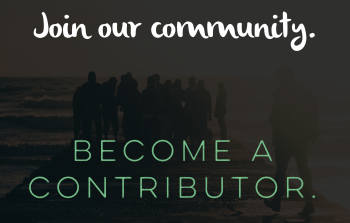 The couple are currently beginning work on book that will be as much a cookbook as it will be about their journey throughout Mexico, gathering inspiration from seasons and the local landscape. Because of El Ganzo’s isolated location, there are few neighbors to contend with when the musicians in residence give their concerts or when the hotel throws a party, for private guests or otherwise. Ella tells me that they’ve had parties lasting until five in the morning. “Only the whales will complain” she says laughing, referencing the humpback whales that pass through Cabo’s waters beginning in November. And it’s no wonder the parties sway on to morning, with the range of musicians on El Ganzo’s roster. The studio plays host to songsters from virtually every genres, and recent guests have included Brett Dennen and the Nashville-based, about-to-burst-on-the-American-scene, Jenny and the Mexicats. 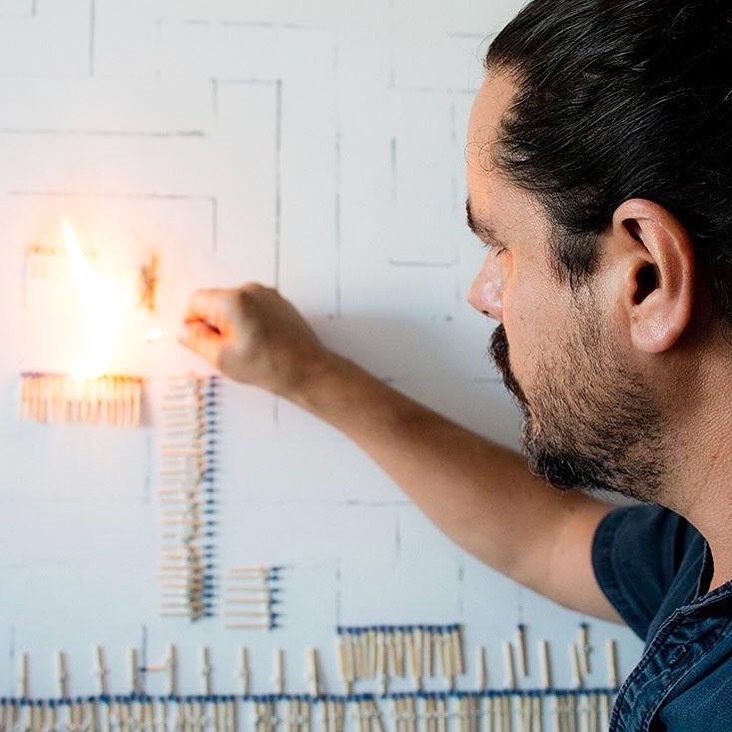 Ernesto Ríos, the current artist in residence (May 2018) is working on a guest room (No. 215) and a hallway on the first floor. 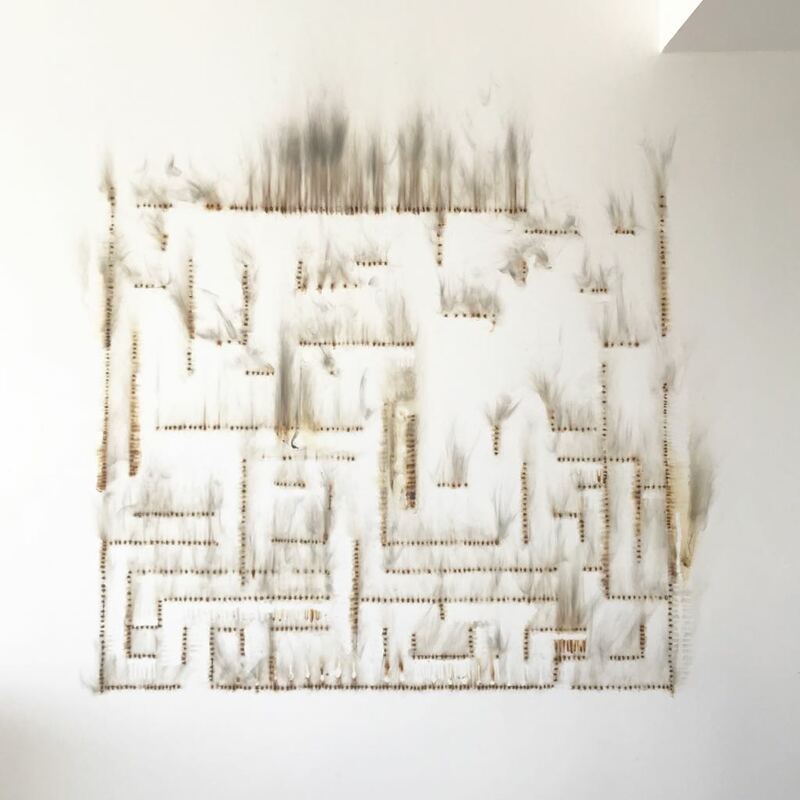 He has an ambitious plan for the guest room, taping thousands of matches to the wall in labyrinth pattern, burning them line by line. After the matches burn away, what’s left is a pattern of smoke and etched burn marks that look as beautiful and raw as if they had been painted on by hand. 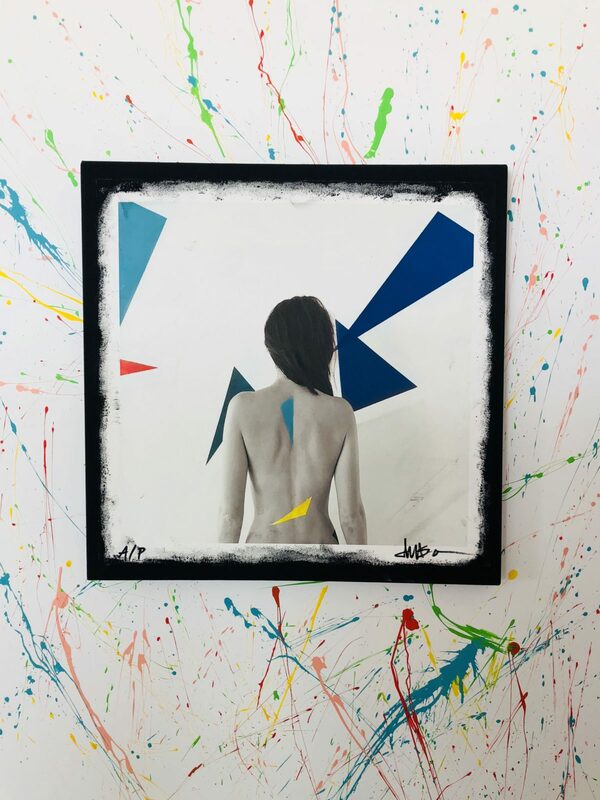 Ríos cites the air and the atmosphere of Cabo San Lucas for drive of his work. 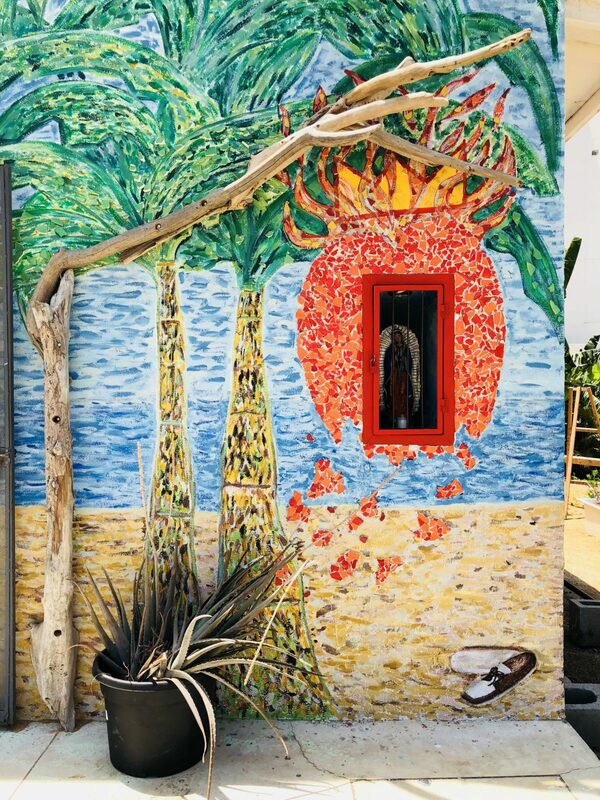 Although artists come to El Ganzo with an idea of what they will leave behind, it’s an organic process that shifts with their stays and the overflow of inspiration, whether it be the fisherman off in the marina, the ocean, the magenta sunsets, or the first early light of the dawns. “The space has been inspiring me,” Ríos remarks, “This place changes you. El Ganzo changes you as much as it changes itself. 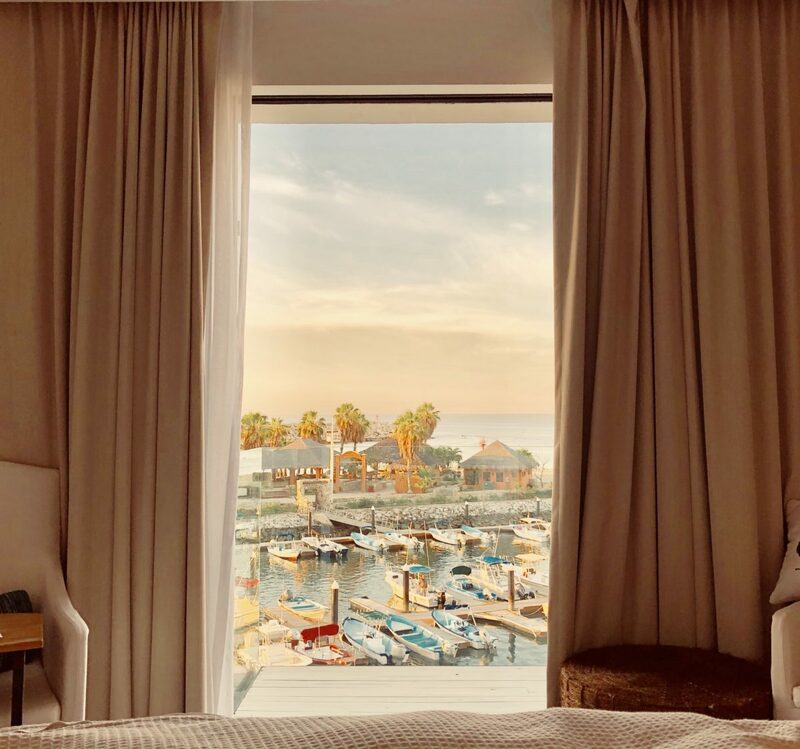 Some rooms, like mine (room 319 with sweeping views of the marina and ocean beyond), are constantly evolving pieces of art. 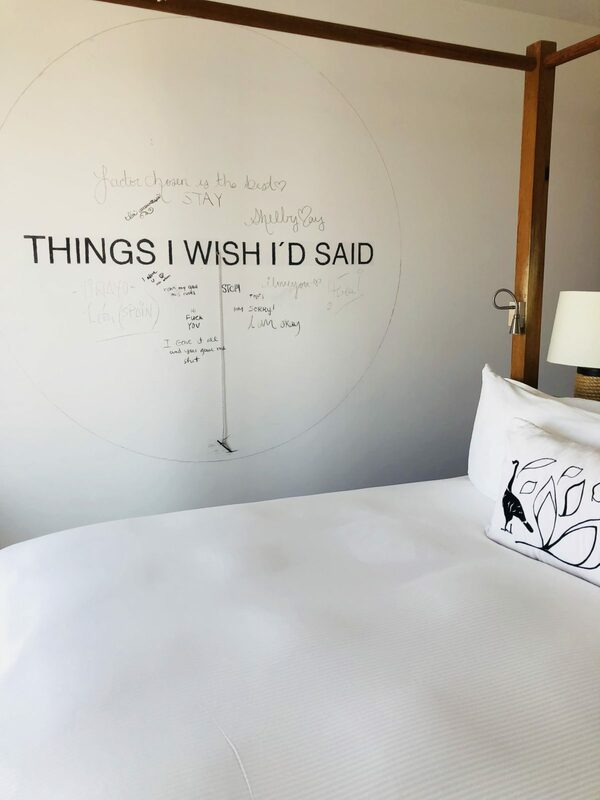 On the right side of my the bed, plastered on the wall is a circle with “Things I Wish I Said” emblazoned through it. A piece of charcoal attached to a string in the middle of the circle hangs enticingly encouraging guests to write their secret. “We want guests to write their stories while they’re here” Miriam Reuter, El Ganzo’s sales manger tells me. “Stop Thinking” is also imprinted above the bathtub although I hardly need reminding. The soaking tub, four poster bed and glass balcony are reminder enough. Did I take up the charcoal and add something to the wall? Of course. But I’ll never say what it was. That’s for those who stay in El Ganzo Room 319’s eyes only.